The Army of the Damned is an army of damned robots from Robot Hell. It was organized by Bender after he became head of the League of Robots, trading his firstborn son with the Robot Devil for it. Originally created for the purpose of conquering Earth, it found a purpose in restoring the Earth's population after everyone left the planet behind for the robots. It was once formatted to appear as a pirate ship crew. 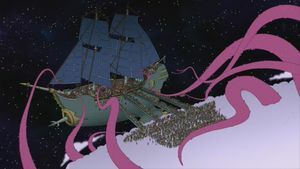 The image of the army as pirates appears inside a 'no sign' at the beginning and end of an anti-piracy warning found on the Bender's Big Score DVD. One of the members, to a large extent, bears a physical resemblance to Clamps. Another resembles The Masked Unit. The title is a reference to the 1960 movie Village of the Damned. This page was last edited on 26 August 2011, at 21:24.